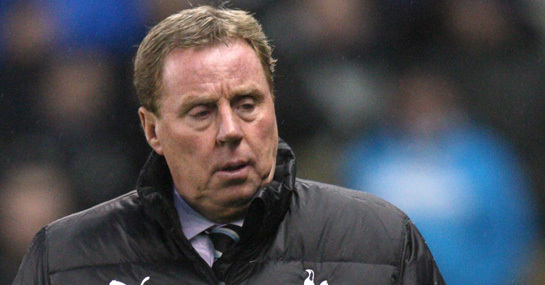 Harry Redknapp has spent a lot of time recently tipping his Tottenham side as potential Premier League champions – but he may have to start tempering those ambitions after defeat at Stoke. Spurs succumbed to a 2-1 loss at the Britannia thanks to an excellent Stoke performance and some less than excellent refereeing. Emmanuel Adebayor had a goal wrongly disallowed for offside and Spurs also had penalty calls waved away by referee Chris Foy when the ball appeared to strike Ryan Shawcross’s elbow on the Stoke line. The defeat has seen Spurs’ Premier League title odds drift to 20/1 from a pre-game 16/1 and they could lengthen even further if Manchester City defeat Chelsea in Monday’s game. However, while their odds may have lengthened, failing to win at Stoke has become something of a habit for the top teams this season. Liverpool also lost there 1-0, while both Manchester United and Chelsea were unable to come away from the Britannia with anything better than a point. They were always a long shot for the title anyway but punters should not be put off backing Spurs to make it back into the Champions League places because of the result. They have very winnable games against Sunderland, Norwich and Swansea coming up – as well as the much trickier visit of Chelsea just before Christmas – and they should be right in the mix after the packed festive schedule. Redknapp’s men are currently a pretty short 4/9 to finish in the top four but that could still be worth backing, with those odds set to shorten even further if they perform as they should over Christmas.